We have spent four days on the road and are now in Weslaco, TX where the skies are clear and temperatures are in the upper 20sC. The trip down was a little tense in that we drove through the very tail end of one storm and just beat the blizzard that was coming down from Colorado. The weather changed very little from Foam Lake to the middle of Kansas where the fog, clouds, rain and snow showers finally disappeared and the skies cleared. The birds, as expected, changed with the weather and climate. 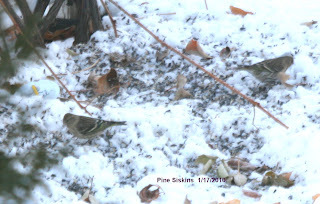 There were many Snow Buntings, ravens and magpies along the roadsides as was expected. However, there were a few exceptions. Just south of Jamestown, ND we saw about six or seven crows feeding along the roadsides and presumed they were a family unit that did not migrate. Another such exception was the presence of a flock of Horned Larks just south of the Moose Mountains. They usually do not show up in our area until the latter half of February. We also saw a Rough Legged Hawk which was not out of place, but still uncommon. From the snow line southward, there were many geese, ducks, Red Tailed Hawks, Kestrels and Turkey Vultures. When we spotted our first Inca Dove we knew we were in the deep south. One nice thing about being in this area of the world is the number of wild pigeons/doves that are found here. The different species are: Mourning Dove, Eurasian Collared Dove, White Winged Dove, Common Ground Dove, Ruddy Ground Dove (rare), White Tipped Dove, Band Tailed Pigeon, White Crowned Pigeon (rare), Red Billed Pigeon (rare) and this week’s featured bird – the Inca Dove. The Inca Dove is a very common dove of the southern USA, ranging from California to the Gulf of Mexico. At first glance it simply looks like a Mourning Dove. 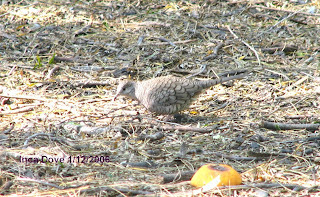 In fact, I had seen many of them before I realized that what I was seeing was an Inca Dove and not a Mourning Dove. However, by paying a little more attention to details, I was able to tell the two apart quite easily. The Inca Dove is much smaller than a Mourning Dove, but in isolation this is of little value. (Where have you heard this before)? Its colouration is such that the bird appears to be covered in grey scales instead of feathers. This characteristic is quite pronounced and can be seen with the naked eye. When taking flight, the wings show a lot of reddish brown and produce a “dry rattle”. Both characteristics are diagnostic. The Inca Dove’s vocalizations are noticeably different from all other birds and have an interesting story associated with them. When Europeans first arrived in the dry areas of the deep south, they experienced many hardships and dangers including hunger and thirst. During the pioneer’s struggles with the heat, the Inca Dove would be making its monotonous two note call that at times seemed to be taunting them. The bird seemed to be telling them there was “no hope” – a very apt description considering the pioneer’s plight. To this day many bird books describe the Inca Dove’s two note call as “no hope”. If ever any birders go south, be on the lookout for the Inca Dove. It is a tame and trusting bird that loves to be around people and is common in streets and yards. Feeders, as such, for insect eaters are almost nonexistent and what does exist is very simple in design. Suet can be hung directly on a tree or post requiring only a piece of wire or string; peanuts can be placed directly on the ground or something like deck railing; peanut butter mixtures can be spread directly on a branch. However, to discourage unwanted “guests” some effort has to be made to protect the food set out for the birds. Suet can be put in small metal cages that can be bought in stores. Once filled with suet, the cage can be hung on a tree or post. Unwanted visitors, such as ravens and cats, cannot steal the suet to eat elsewhere. Yet, birds can still peck at the suet through the grating. Shelled peanuts should be provided in a metal tube similar to that of a seed feeder. Holes are drilled in the sides large enough for the birds to peck through, but small enough to prevent the peanuts from falling out. These feeders are available in stores. This kind of feeder also discourages squirrels - the bane of bird lovers everywhere. Peanuts, shelled or unshelled, will disappear very quickly. Both Blue Jays and squirrels gather the peanuts and take them away and store them for future use. No matter how many nor how often the peanuts are provided they disappear in minutes. One year a jay kept storing the unshelled peanuts that I had put out, so I would go to its storage site, pick up the peanuts and put them again out the next day. The jay would hide them in exactly the same place as before, and I would recover the peanuts and put them out the next day. This routine continued until the jay disappeared. The peanut butter mixture can be spread directly onto a branch or the trunk of a tree if the bark is rough enough. If such a tree does not exist in your yard then some sort of man made device is necessary. Luckily, these are easy to make. A block of firewood with rough bark, such as maple or elm, can be hung horizontally and the mixture spread on it as on a branch. A design that I have developed is a 3” diameter and 12’ long block of wood hung by an eye hook screwed into one end. With smooth barked wood such as poplar, I drill shallow holes in the sides (3/4” wide and 1” deep) and fill them with the mixture. The holes should be drilled at a slight downward angle to prevent the food from falling out. This week’s picture is of a Red Breasted Nuthatch feeding on a feeder of my design just described above. Of the two nuthatches found here, the Red Breasted can be identified quite easily by its distinctive black eye line through a white face. 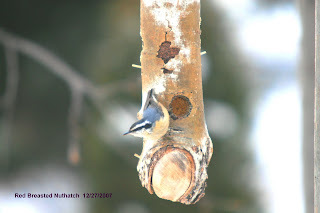 For a more thorough discussion on nuthatches see article No. 32. Over the past several winters we have had a small group of nuthatches roosting in a birdhouse used by Tree Swallows in the summer. Since the food we provide is only a few feet from the bird house, everything is very convenient for them. This winter we have three of them in that same birdhouse in our yard. In all likelihood a few should be in everybody’s yard sooner or later. Feeding seed eating birds is rather straight forward – provide seed that is readily accessible and the birds will come. Feeding insect eating birds is another matter. Fortunately, most resident birds, such as woodpeckers, chickadees and nuthatches, are adaptable enough to substitute oil seeds and nuts for animal (insect) fat and protein. Since providing insects in the winter time is nigh impossible substitutes are necessary. Some good ones are peanuts, peanut butter, fat (suet) vegetable oil and cornmeal. Peanuts and fat are widely used throughout the world where people feed birds. Many people even have secret recipes in the conviction that their special concoctions will attract more birds. In our yard we use industrial peanuts that come in bulk straight from the farms (not roasted nor salted – no processing of any kind). For variety, we make a thick paste of peanut butter, coarsely ground peanuts, cornmeal and cooking oil. Other items such as honey and ground sunflower seed can be added, if so desired. Birds do like this mixture. 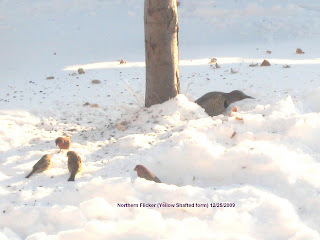 Suet, the old standby used by our forefathers, is still very effective and inexpensive. Most butcher shops usually give the stuff away. Commercially prepared suet blocks are also available. However, to make the suet blocks last a long time, the fat has to be rendered. Then some seeds (shelled if necessary) are added before the fat solidifies. I have found that this product gives mixed results. Having tried this product many years, I have not been able to attract any birds at all (even Magpies would not touch it). On the other hand, I have talked to people who have had great success with them. The only thing to do is to try and see what happens. Our resident birds will usually eat all of the items mentioned in this article. Woodpeckers do prefer the suet while chickadees and nuthatches seem to have no preferences. Woodpeckers will not eat oil seed while House Sparrows will not eat suet. The thing to keep in mind is that seeds can be provided all year round while concoctions with fat in them will go rancid in the summer and can only be provided in the winter. 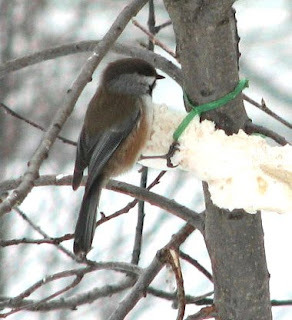 This week’s photo is of a Boreal Chickadee feeding on suet in our yard. It is a rare winter visitor from the Boreal Forest that is a welcome addition when it does come. 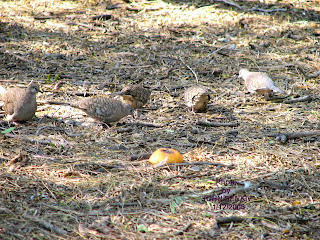 There were three of them in Foam Lake in the winter of 2006 – 2007. In a black and white picture the Boreal Chickadee looks like the Black Capped Chickadee, but in colour or observed in life it is noticeably different. The Boreal has a lot of brown on its sides while the Black Capped has some buff; the Boreal has a brown cap while the Black Capped has black. The Boreal’s song and call are like a hoarse version of the Black Capped. The Boreal Chickadee is my “favourite” bird. Why? It was the bird that turned my wife into a birder. How? We lived in Wishart at the time and my wife could barely tell a robin from a crow. One winter, much to her amusement, I decided to put out some suet and sunflower seeds in our backyard near our glass patio doors. This arrangement provided a good view of the birds at mealtime, and very quickly we had a variety of birds at the feeders. One morning when we were watching chickadees feeding on the suet my wife said that one of the chickadees was different. Being a good husband, I decided to humour her by taking a look with my binoculars. To my complete surprise, she was right. It was a bird that I had never seen before - the Boreal Chickadee. I immediately went to my neighbour, a birder decades older than I was, to point out the bird to him. He, too, had never seen one before. This event piqued her interest and a birder was born.